Lyme disease is a bacterial infection transmitted through a tick bite. Lyme disease cases are growing steadily throughout the U.S. and many people today suffer debilitating symptoms of chronic Lyme disease. Often, the disease can be mitigated with early use of antibiotics. However, for many, chronic lyme symptoms persist for years. For the chronic lyme sufferer, there have been few effective therapies. Now, near infrared sauna therapy is emerging as an alternative therapy for chronic lyme symptoms. Near infrared sauna therapy has a profound and deep effect on human physiology that comes from our very basic biological response to light and heat. The therapy consists of daily 30 minute sessions in a near infrared sauna. A near infrared sauna is an indoor, electric sauna powered by near infrared heat lamps. 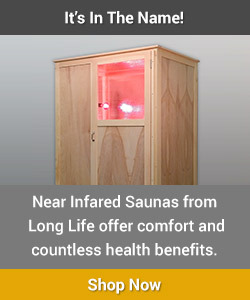 Near infrared light has a powerful anti-inflammatory and regenerative impact that no other type of sauna can deliver. For the chronic lyme sufferer, near infrared therapy can help in 5 distinct ways. First, near infrared light penetrates easily and deeply into the tissues where it delivers heat. In a typical 30 minute session, the user’s body temperature will rise about 2 degrees F. This safe and mild hyperthermia can directly weaken spirochetes while prompting an enhanced immune response. Second, the natural response to sauna heat is an increase in peripheral circulation. Near infrared light enhances this effect because it stimulates the production of nitric oxide, a signal chemical that enhances circulation. Improved circulation will enhance the effects of any herbal or anti-biotic therapy by improving the delivery of those compounds to infected tissues. Third, near infrared light is an FDA approved anti-inflammatory pain reliever. Regular use greatly relieves aches and pains in the joints. Fourth, near infrared light stimulates cells to produce collagen, ellastin and proteins. This is a key benefit for Lyme sufferers. In the long term, spirochetes burrow into connective tissue causing a lot of damage that results in intense joint pain. Near infrared light can penetrate into these tissues and encourage cells to rebuild. Fifth, near infrared sauna therapy is a great way to detoxify heavy metals and chemical toxins. Some research suggests that chronic lyme sufferers have heavy metal toxicity. Sweating is the easiest, safest and oldest way to remove heavy metals like mercury from the body. Until there is a cure for lyme disease, near infrared sauna therapy may provide the widest range of effective relief for chronic lyme symptoms.